So, why did we choose these 4 items for this set? Keep reading below to find out! The Rosetta Explorer is the ideal pen for a fountain pen starter set. The nib and feeder system provide flawless ink flow. The polished stainless steel nib is iridium tipped for ultra-smooth writing. The barrel is made of a high-impact ABS resin, providing strength at a very light weight (14 grams). A window in the barrel lets you see how much ink you have left. The Explorer fountain pen also comes equipped with a converter for bottled ink. 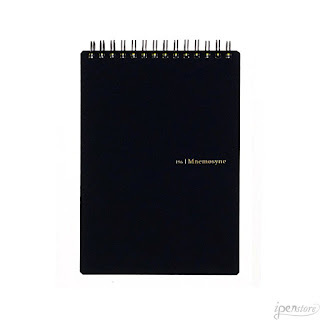 Mnemosyne notebooks by Maruman are perfect for writing and note taking on the go. The 196A notebook is B6 size (5" x 7.5", or 127 mm x 190 mm). This notebook features 7 mm lined spacing, and a bold line every 7 rows. The top wire-bound binding makes it ideal for right or left handed users. The best feature of this notebook is the 50 sheets (100 pages) of 80 gsm acid-free, archival quality paper. Each page is micro-perforated for clean removal. The paper is super smooth and very fountain pen friendly, so new fountain pen users wont be frustrated or turned off by feathering or bleed-through. Nearly every experienced fountain pen user will agree that bottled ink is king when it comes to filling a pen. Some new fountain pen users are happy to dive right into bottled ink. However, other novice users will sometimes view the (sometimes messy) task of filling a pen with ink as tedious, or unnecessary. So, we've included both cartridges and bottled ink with our set. The fountain pen rookie can begin writing with cartridges, and then upgrade to bottled ink when ready. The Rosetta Explorer Fountain Pen comes equipped with a converter, so it's easy to try both cartridges and bottled ink. We choose Pelikan Brilliant Black ink for this set for it's consistency and clear line definition. For the price, Pelikan inks can't be matched on color saturation and quality. The tried and tested German made Pelikan 4001 inks are optimally formulated for any fountain pen to provide incredibly reliable ink flow. The Rosetta pen, Maruman paper, and Pelikan Bottled Ink, and cartridges are the perfect tools needed to get started on the fountain pen journey. However, a new user will also need some direction. Luckily we've got that covered! Every Rosetta Explorer Fountain Pen comes with a full instruction sheet on how to properly care for and fill a fountain pen. The instructions include filling with cartridge or bottle, as well as full instructions on properly cleaning and maintaining a fountain pen. Have you introduced anyone to the joys of using a fountain pen? If so, how did it go? If you have any suggestions for others, let us know in the comments. Also, let us know if you have any other products or tools you like to recommend to new users. Win a Rosetta Explorer Starter Set!